The straddling or elevated bus first exhibited on the 13th Beijing International High-tech Expo 2010, and is believed to provide the accurate solution of traffic congestion experienced by many megacities worldwide. This elevated bus designed by Shenzhen Hashi Future Parking Equipment Co., Ltd, the model looks like a subway or light-rail train bestriding the road like the letter of 'n' is given the cap on top of it. The Chairman of the company has said that it would only take a year for one to be built. So you can imagine that the straddling bus is a pit or fissure-like tunnels, thus allowing smaller cars can run on under/below it. The straddling bus has a width of approximately 7 meters and an overall height of about 4 - 4.6 meters, of which about 2.2 meters for the high of vault under the bus and about 2.4 meters to the height of the bus itself. Here is the presentation by Song Youzhou, chairman of Shenzhen Hashi Future Parking Equipment Co., Ltd. This elevated bus could replace up to 40 conventional buses, so they can save up to 860 tonnes of fuel that used by 40 buses each year and reduce carbon emissions by 2,640 tonnes. The transport vehicles that can carry up to 1,200 passengers do not need much to change the road infrastructure, because it took advantage of the space is so far not utilized. Despite the large body, straddling bus also environmentally friendly because it powered by electricity and solar. 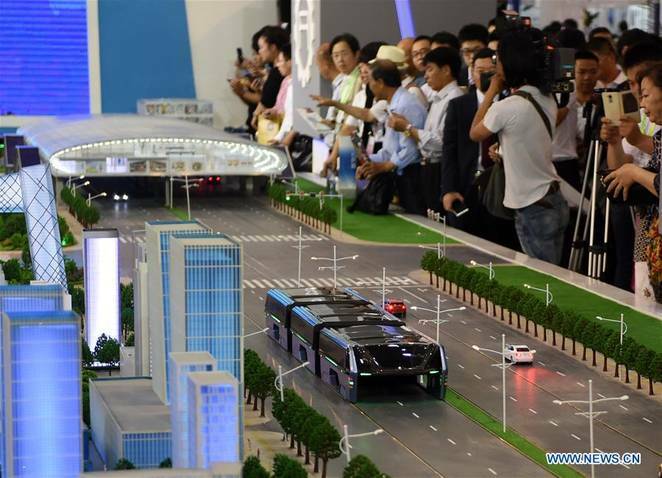 Straddling bus is capable of running at a speed of about 40 - 60 km per hour are expected to reduce the traffic congestion by 25 - 30% in the main streets. Same with other buses, straddling bus is also has stations for the public to use. This giant bus also has a good security system, such as an emergency brake, windows and emergency stairs which can be used in case of a road accident, technical error, etc.